I’m trying to create a working Budget. 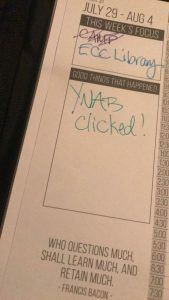 This is a post I shared with a Facebook group for folks who use YNAB (You Need A Budget). It felt really good, like a huge win, for this to happen today. Big enough of one that I tackled some work that had the potential for that retraumatization I talked about in my last post, and came out on the other side only exhausted, and not reeling. Spoon balancing act for the day, successful. ”So this isn’t my first attempt at YNAB, but for some reason I couldn’t wrap my brain around the core concept of assigning my money jobs. I’m working with a financial coach (I fondly call her my Money Boss) and when she told me that the goal is for my ‘to be budgeted’ to always be zero, the gears began whirring. Today, my first payday after our second meeting, everything clicked into place. I had gotten to zero then realized I hadn’t put in my car payment (I’ve only made two so far, she’s new). I thought, where am I going to find these dollars?? then remembered that I didn’t need to budget for the month, but only until more $ came in. So I backed out CC payments that are due after my next paychecks; halved the month-long true expenses like groceries and gas; checked my dates for scheduled haircut, therapy, RX refills; and was back to zero with a few adjustments.